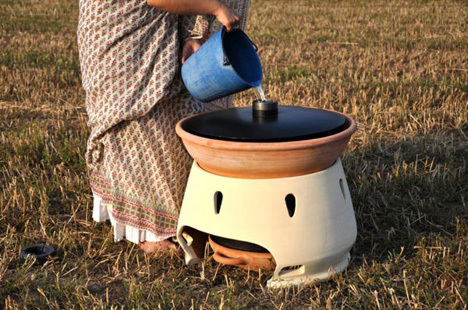 Eliodomestico is a solar powered water distiller designed by Gabriele Diamanti and it is part of the series of smart designs for social good. The idea behind it is simple. The designer and innovator wanted to produce an eco-friendly device which will be useable in remote and underdeveloped areas, near the sea, by poor people who had no or limited access to pure drinking water. What the inventor has produced is an ingenious product which is useful by the poor people, looks homemade and above all it works using a renewable energy source, the solar energy. In order to understand how Eliodomestico works it is important to understand what we mean by Solar Power since this specific water distiller is solar powered. Solar power is simply the power from the sun. The power of sunlight it converted to electricity using various methods one which Photovoltaic, PV, cells which known as the direct method. Another method is an indirect method where the sunrays are first used to heat and boil water which is then used for the production of electricity and is known as CSP, Concentrated Solar Power. In the case of the Eliodomestico there is no electricity involved. The sun power from the sun’s sunlight is just used to boil water. One can say that it is half of the CSP process. Let us find out how this innovative solar powered water distiller works. It is a new concept of solar distillation for the developing countries. It transforms salty water from the sea into fresh drinking water just using the direct sunlight with no electricity, no filters no moving parts. This means that it has no maintenance and no operating costs, both of which are important in the poor countries where the citizens have no expertize and very little means. You just fill this solar powered distiller with salty water and go away. At the end of the day you have 5 litres of fresh drinking water! The upper part is a black boiler with a water tight cap. It has a water inlet through which you put salty water in the morning. Once you pour the water in, you tighten the cap so that you will not lose the steam and you let the sun do the desalination for you. The distiller is left in the sun and as the day passes the temperature increases so does the pressure. The generated steam is then forced to go down reaching the lower part where there is a metal lid, through a metal pipe, which acts as the condenser and thus turns the steam into fresh water. At the end of the day you just have to collect the fresh water. This is it: Simple and genius, practical and cheap. The innovation about this water distiller is not only the method it uses but its components as well. It is a 100% local production with widely used local materials such as clay and recycled metal sheet, thus adopting the 3Rs concept of Reduce Reuse Recycle. It also uses local technologies and skills like pottery and tin welding. Since the production is made by local craftsmen it has no transport costs thus supporting the local economy. The design of Eliodomestico is such that it would enable its assembly to be done easily by any skilled or unskilled person. What is important about this water distiller is that it is an open source project so that anybody can modify and upgrade it so that it will always be a work in progress to suit the needs of the local communities. The device as it has been designed can deliver 5 liters of precious clean fresh water per day and thus contribute to the improvement of the standard of living and hygiene of the people in the developing poor countries. Eliodomestico costs half of what other water distillers cost and it is about 60% more efficient than many of them thus making it a very attractive device from all perspectives. It has recently been priced around 50 USD but its price can be reduced if locals participate in its production and off course depends in which community it is produced. What is important to note is that Eliodomestico is an innovative solar powered water distiller which has won an innovation award in 2012 since it was considered as one of the best inventions of 2012. Eliodomestico is another application of the idea of using Renewable Energy Sources, RES, for the benefit and development of mankind.